As the Bomb Aimer for S/L Hamber, Neal stayed with that crew for eight operations. By the middle of March F/O Neal had left Hamber's crew and became spare bombardier at 419. S/L Hamber and the remainder of the crew were posted to to 426 Squadron in April. After returning from Leave and he asked to be with T/Sgt. Thomas's crew who had yet to fly any operations and were assigned on the operation for that very night, April 22. According to Neal in his book "The Lucky Pigeon" his first ever meeting with this new crew was at the briefing just prior to take off. He gave the crew a feeling of confidence and his operational experience was certainly an advantage to a crew headed out on their first sortie. The chaos of bailing out of the Halifax and hitting his chin on the edge of the hatch were now behind him. The danger now came from the fighter which had remained in the area. To Neal as he drifted down to earth it appeared that the pilot of the fighter intended to finish him off as he had done with the bomber. The fighter swooped by him as close as was possible without hitting F/O Neal or causing his chute to be whirled around by the fighters slipstream. John Neal always seemed to be lucky, and as the months of his evasion passed, more than once was Luck on his side. After his descent from 6,000 feet he landed without incident. As the noise of all the bombers overhead disappeared and the explosions from the raid died away he realized he was not alone. The voice of a man then a woman very close to him could be heard, stopped him in his tracks. With all that was going on in the area and of all the places to land, Neal had landed close to a "romantic " couple ! Back in the safety of a wooded area Neal opened his escape kit and using up the few Horlicks tablets from it to help fight his hunger. Horlicks was a popular British malt drink that boosted energy and was in escape kits for British and American flyers. Unfortunately the drink was negligible in fighting the hunger. He maintained the use of the forest edges and staying off the main roads. He moved on hoping to find shelter and food with little result. Walking through forests was sapping his energy and his hunger over came him after three days and he ventured to try a cottage he had come across. At first unsure of her visitor at her door, Neal simply said "Je Suis Canadien" the expression on the woman's face instantly changed and she brought him in. With help of her neighbours the two families and friends all joined in a small celebration. The people in the cottages were all Polish refuges they gave F/O Neal what little food they could get together then all watched as the new found Canadian ate. The Poles could not keep him hidden, as they were often under watch of others, but they provided him with provisions from what little they had for his journey. And Neal was on the move again. John Neal kept to the back roads and forests, a part of his training he had received while with Hamber's crew. During the weeks while they awaited posting the crew were on a course on escape techniques and survival while on the run and it was now paying off. Neal was very determined to get to Paris. On this one night the fog settled in and so dense he was slowed by the uncertain footing and knowledge that deep ditches lurked along the roads edge. The danger of walking straight into a guard post or patrols was heightened in darkened out of focus world he found himself in. As the light of day began to clear the view he came upon the village of Suzy. He sought shelter and the two farms that he was approaching both had haystacks. He decided on one of them, dove in and covered himself. Later in the day the farmers dog discovered him and led the farmer to the hiding place. Luck again was with Neal, the farmer hid him until night then kept him hidden around his farm for two and a half weeks. It was during this time Neal learned that if he had selected the other farm he would have most certainly been turned over to the Gestapo. The farmer of the second farm was a known collaborator. Interestingly one of the visitors to this farm Neal was being hidden on was an older German soldier who bought eggs and milk from the farmer and seemed not to care about any goings on. Up to now the people he met accepted him as who he said he was, a Canadian airman shot down. But the R�sistance questioned him more thoroughly. They were about to place Neal into their escape system and the enemy had more than once tried in infiltrate the network. After being satisfied he was who he claimed to be they took his uniform and dog tags supplied him with fake ID and civilian clothes. The next stop was to Bithancourt Marizelle. It would be here at Bithancourt that he was reunited with HX189's navigator, Bob Lindsay, so now two of the crew were together again but the two still were unaware of what happened to the others. After a week they were moved on to Chauny and placed in the care of the Daubercies family,a local Justice of the Peace. The appearance of the evaders needed to be changed, his hair was becoming unlike the civilians around him. It was decided to send him to the town barber and get his appearance more French in style. The Daubercies enlisted the help of the young girl next door to get Neal to the barber. The two had become friends during the long hours of hiding. Once at the barber the young girl Josette told Neal that the building across the street was the Gestapo HQ. Once asked if he was calm while the barber did his job, Neal replied "are you kidding !" June 6th D-Day came and the Resistance told him and others to be ready to leave in two days. All the other evaders, some thirty or so were brought together and ready at yet another safe house this one in Bethancourt-en-Vaux. Here the Reyns family sheltered all these men and no one was allowed outside except at night and only in the garden. This continued long after the two days, and two months past and still they were all there. Not until September 1st were they liberated by a company of US Army Engineers. With all the months of waiting in hiding and now the waiting while the paper work was sorted out the mess of Refugees, PoWs, deserters, AWOL service men of dozens of nations, the organization of repatriating PoWs back to Britain was dragging on. In the end John Neal had enough and again with Paris as his goal left on his own. With no proper papers or uniform he was picked up by American MPs and placed in holding cell with German PoWs. It took time for it all to be sorted before he again he was on his way to Paris. He did make it in the end just in time for the celebrations going on there. He was given tour of the city by a postman and met many people who were happy to meet an airmen. As he said all too soon it was over and he was back in Britain being questioned and examined. All returning prisoners were given interviews and the forms were about their imprisonment and their liberation. Medical exams were also given to all returning service men for a number of reasons. Back home in Canada on the very same day he was liberated in France, September 1st. his mother received a letter from the RCAF saying that nothing more had been heard about him and that they were sending his kit home. 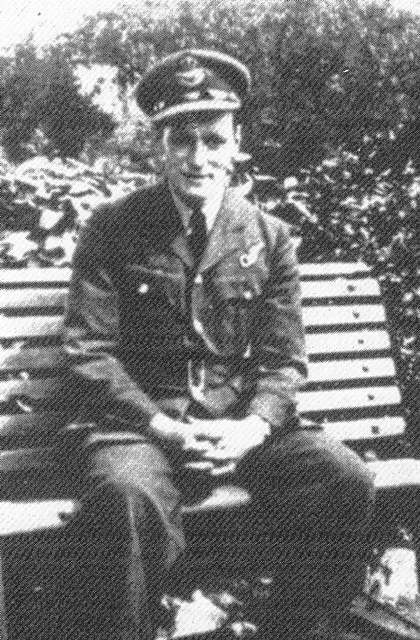 P/O Victor Alfred Knox the Rear Gunner aged 21 of Toronto was killed during the mission. Sgt. Thompson became a Prisoner of War #3679 at Stalag 357. T/Sgt. Chuck Thomas (USAAF)evaded capture and even though wounded made it back to Britain via Spain. Luck was always with him, even before this story that began in April of 1944. Back in 1943 during training he decided not sit in his normal position during the series of Circuits and Bumps he was involved in. As it would happen during one of the landings the undercarriage collapsed and aircraft crashed. Neal escaped without injury. That same year in December the Auto pilot caused the aircraft he was on to just to miss the series of hills that spread in front of them. And on a previous operation with his first crew while returning from Berlin the base they were to land on became heavily fogged in. The pilot was told it cleared at 400 feet, so with Neal in the nose and everyone that could look were trying to spot the base. When the North Sea sprung into view, and he had to yell to the pilot to climb.